Our graduate dance company tours annually to festivals, theatres, schools, and residential centres. Comprising graduates of our training course Trainee Programme, the graduate company has a rapidly growing reputation for performances of high quality contemporary dance. We know that dance is possible for all people, regardless of difference in physicality or learning ability. Our Trainee Programme inspires and engages audiences of disabled and vulnerable people. 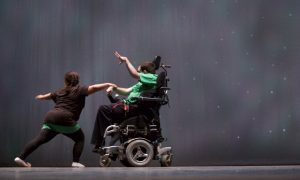 Watching a performance by disabled/non disabled dancers raises audience expectations about what they are capable of achieving. Exercises put the participant at the centre of the work. Participants are gently encouraged to devise their own choreography based on the range of movements unique to them. The group then joins and contributes creatively culminating in a performance devised entirely by themselves. Our programme supports both participants and staff to work inclusively and to unlock their creative potential.